Translation of Outi Alanko-Kahiluoto’s article, published on her blog, with her authorization. Outi is a MP and chairman of the Green parliamentary group. 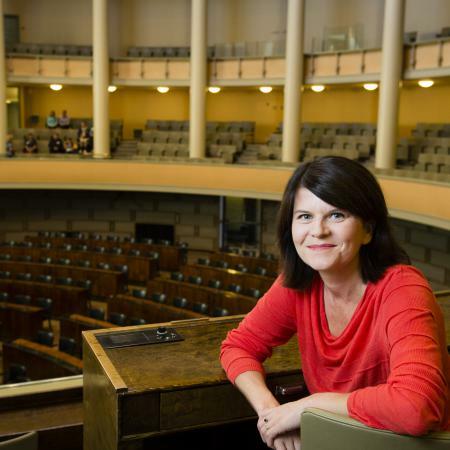 Her background is at the University of Helsinki as a researcher and teacher of literature (Doctor of Philosophy). Yleisradio’s (Yle) financing model was reformed during the last Parliament term. The main objective was to secure continuous and predictable financing for the public service broadcasting company, without yearly interference from the politicians. All Parliament parties participated in the decision-making – both the Cabinet and the opposition. After lengthy negotiations it was decided that license fees were to be replaced with an Yle tax which would, in turn, as opposed to license fees, guarantee Yle a predictable and sustainable finance base. Yle has a critical role in facilitating versatile and diverse communication. It is for that reason that the Parliament has emphasized that its financing must be decided by all parties so that Yle will not become a pawn in the political game. If that were the case, it would no longer be independent. Specifically, to secure its independence, Yle operating under the Parliament as a whole is widely seen as positive, as is the fact that and laws regarding it are decided between all parliamentary groups. Sipilä’s government has, however, resigned from this principle. The Centre Party, the National Coalition Party and the Finns Party announced that they have all unilaterally decided, without negotiating with the Parliament parties and the opposition, to decrease Yle’s financing. This will be executed by both freezing the Yle index as well as decreasing Yle’s tax revenue. The decision means that the Cabinet is clearly resigning from any previous policy models which had been decided by all Parliament parties. If – and when – the Cabinet starts to interfere with Yle’s financing, Yle becomes the media of the government, instead of the whole Parliament. In other words, the government of Sipilä, Soini and Stubb has decided that, in the future, Yle’s financing depends on the values of the governing parties, and that versatility and diversity are not relevant in media funded by the taxpayers. Free, independent media is the core of democracy and open and diverse communication. The need for authentic, fact-based media is only growing, however, Yle has already had to modify its operations considerably due to the cuts. Media and communication must be independent from the decision makers so that the citizens have an opportunity to publicly discuss the consequences of the decisions and give a voice to different groups such as minorities or the disadvantaged. This is outlined in the Yle law, which the Cabinet also intends to reform. If the Finnish democracy means anything to the current Cabinet, it should cancel all unilateral proposals regarding weakening Yle finances. The finances issue should be dealt with by the Parliament as a whole and handled by all Parliament parties. The process during which Yle finances are decided is part of its independence. It is rather ill-fated for the Finnish democracy, as well as the independent media, if the Cabinet does not admit this.